It is mainly made of pages related to electricity around the time you operated an electronics store, but there are also interesting stories on interactions with customers, as well as postings to newspapers etc. as well as electricity. Popular pages are information on electric shock and earth (ground), information on electric leakage and electric fires. It was published on pages 71-73 of the February 2013 issue of the personal information magazine "I / O" for homemakers and 71-73 pages of the March issue. It was a request for writing around November 2012, and the title is "Basic How to Use Testers" and Tricks (Part 1) and March issue (Part 2). 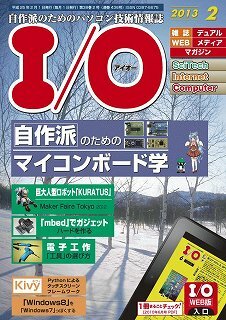 Monthly magazine "I / O" is 980 yen issued by engineering company, released on 18th month of the previous month. 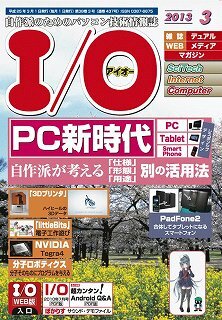 It is the best information magazine for making personal computers and microcomputer related peripherals yourself. It may not be said that it is not a big bookstore. An annual subscription (11,760 yen) is convenient. The content is what we rewrote by arranging "How to use testers" on this homepage. I used many figures to make it easier to understand. The article on the homepage is the original which became the basis of the magazine. In order to use the electricity, safely grounded earth is very important. I explain the necessity of earth and the actual ground with theory. As shown in this figure, the transmission and distribution to the home is transforming the high pressure of 6600 V to 100 V / 200 V for household use with a transformer. Earth ground is necessary for the pole transformer so that high pressure does not get into the low voltage circuit. Due to this ground, you may get an electric shock if you touch the low-voltage circuit. In particular, the calculation method of the grounding resistance is what I thought independently. I think that you can understand the concept of grounding resistance well. It compares the heat of Joule heat of electricity, air conditioner, kerosene and gas, the heat quantity considered from the theory and the economy of various kinds of energy. Various tools are necessary for repairing electric appliances and for installation work. I will show you what tools are needed, how to choose tools and tools, how to care for them, and more. Especially the oscilloscope is useful for efficient repair and production. A tester with a simple structure is also very useful for repairing.